Order this Mission Ottoman with one of our lounge chairs or to go with your existing furniture. 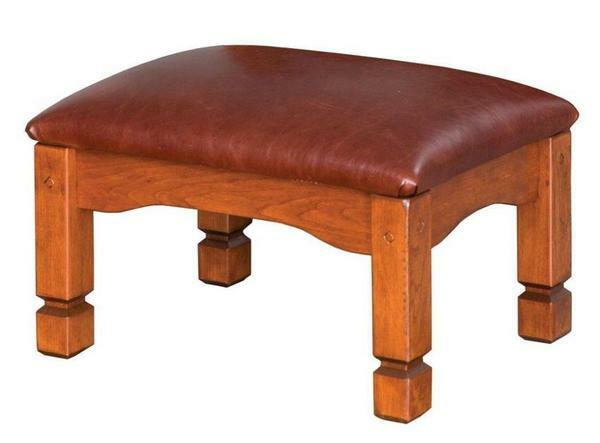 This Mission Ottoman is shown in rustic cherry wood with a harvest stain but can also be ordered in brown maple wood and oak wood. If you would like to receive finish samples before you order please call one of our Amish furniture specialists today at 1-866-272-6773. Note: Customer can provide own fabric or leather. Call for more information. 2 1/2 yards of fabric or leather is needed. Shown in Rustic Cherry Wood with Harvest Stain and 2460 Antique Leather. Thank you for sending the other leather pillow. It arrived last week. I meant to paint the office — the new wall color will be more flattering— but the couches are working out very well. Please share these photos and let people know how pleased I am once again with the work.